Pioneers in the industry, we offer mesh napkin tray, resin napkin tray, ss3 napkin tray, vie napkin tray, en napkin tray and coco napkin tray from India. As an eminent enterprise of this industry, we are offering a supreme quality Mesh Napkin Tray. These napkin trays look so exquisitely royal, that it surprises you that it has utility value too. Also, our napkin has an opulent embellishment in form of a metallic mesh and crystal. Customers can avail these napkin trays from us at affordable rates in a given time frame. 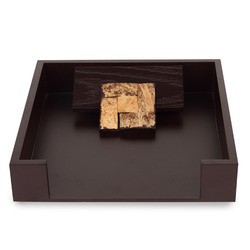 Being a quality-centric organization of this industry, we are engaged in offering a wide array of Resin Napkin Tray that will add elegance to your home decor. 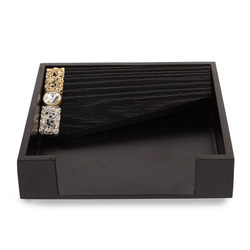 Lift the crystal and resin shredded flap of this fine napkin tray to pull the napkins when needed. These napkin tray are designed from the best quality of material & latest techniques in fulfillment with the set standards of market. Also, these napkin tray are properly checked from our side for ensuring its defect free range to customers. In lined with the industry set norms, our reputed company is engaged in offering a vast range of SS3 Napkin Tray. Our napkin trays keep your napkins/tissues neatly in its place by a gold beaded circular flap with an intricately carved laser motif on its top. As well, we offer these napkin trays in quality packaging & delivered within a committed time frame. These napkin trays add a subtle charm to your dining table. 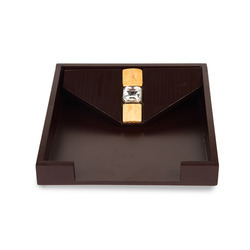 Being the leaders in the market, we are engaged in offering a wide range of VIE Napkin Tray. 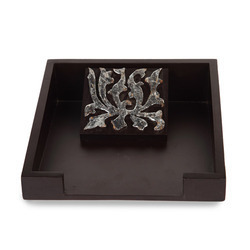 Our offered napkin tray is designed by our creative workforce using finest material & best techniques in accordance to the set norms of market. 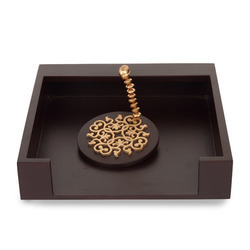 In addition, this napkin tray can perfectly fit in any elegant home decor. Our customers can avail these napkin trays from us at reasonable prices. 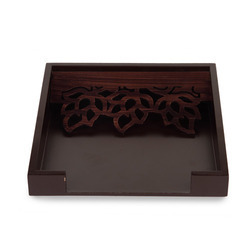 A napkin tray made of MDF in veneer look polish with an intricately laser cut flap to hold your napkins. 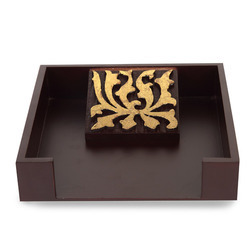 Ethnic yet modern, this napkin tray will add age old charm to any interior decor. A subtle yet classy Napkin Tray to put your tissues or napkins. The flap with real coconut shells acts as the weight to keep the tissues from flying off. 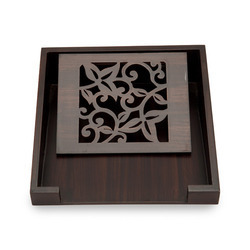 Looking for Decorative Napkin Tray ?